So a dozen 16MP cameras are equal to 520 analog ones? Of course, that is absurd, as examined in our posts on Arecont's Magical Marketing and Avigilon's 'Up to' claims. However, this takes the next illogical step of replacing hundreds of cameras with a handful of megapixel ones. "In the above scenario, a large surveillance system covering a large area, such as a 25,000 square feet parking lot, needs 520 IP/analog cameras to achieve the same resolution of coverage as 33 5MP cameras or 12 16MP cameras." 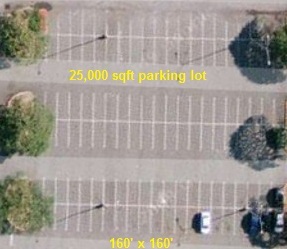 In this 'large' area, Avigilon assumes that 500 analog cameras would be covering 100 cars, for a 5 camera per car ratio. Sigh. Does the surveillance industry have such low standards that Avigilon feels no shame? Does Avigilon have anyone in power who understands how surveillance systems are designed in the real word? Can we not demand even a minimal level of expertise?